Articles by "WC Montreal 2017"
In the floor exercise final at the last World championships, Vanessa Ferrari suffered a fall on her second tumbling pass injuring herself. The Italian gymnast grabbed her foot and medics rushed onto the podium to assist her. It was later revealed that she tore her left Achilles tendon. She was the last female gymnast to compete at the World championships. Ferrari received a score of 3.933. She scored 2.0 in the D panel and 8.233 in the E panel. She had also received a penalty of 6.3. Here is our explanation to why she received such a deduction. In the difficulty panel, the eight elements in a routine are counted. Gymnasts are allowed to do seven or more elements without risking deductible penalties. Gymnasts who do five or six elements only, receive a penalty of 4.00 - three or four elements, receive a penalty of 6.00 - one or two elements, receive a penalty of 8.00.
hence she received a 6.00 deduction. The other 0.3 deduction came from stepping completely out of bounds. Montreal was the competition of injuries. So many gymnasts suffered from it, whether it was because of the lightening or the unprepared equipment. A total of nine female gymnast and eight male ones hurt themselves. Here are the male gymnasts who sustained injuries. Yang, who is the first South Korean gymnast to win an Olympic Gold - which was on vault on 2012, injured his hamstring on vault in warm-up before the events final in Montreal's last day. Yang had to withdraw from the competition and was replaced by Russia's Artur Dalaloyan. The South Korean gymnast qualified in first place and was the favorite to win the gold medal. Groza suffered from a scary fall on high bar during the qualification and had to be carried off the podium on a stretcher. It was said that he injured his back and was taken to the hospital for X-rays but turned out to be fine. Audrys suffered from severe pain in his left knee. In the qualification, he fell on his first vault and decided not to perform his second. Before the competition, he submitted a new vault, Roche with a 1/1 turn. Just like Groza, Lopez had a very bad fall on the high bar and had to clap his hands to signal he needed help. He was later seen with bandage on his face. The Azerbaijani gymnast crashed one of his tumbling passes injuring his right leg. He was seen hopping on his left leg. He stopped the routine and had medics check him. According to Gymternet, the French gymnast hurt his ankle. Clay injured his knee on floor exercise during the qualification. He fell on floor and medics had to check him. The megastar injured his left ankle on vault during the qualification which forced him to withdraw from the competition. From the moment gymnasts arrived in Canada till the end of the competition, Montreal was under heavy criticism for the large number of injuries sustained. The few minutes of podium training, lightening and unprepared equipment were assumed to be the cause of the injuries. Here are the gymnasts who fell victim to injuries at the World championships. Iordache's injury was widely publicized in Montreal. The unfortunate gymnast completely tore her Achilles tendon on floor exercise during warm up just before the qualification started. The 21 year old gymnast will go through nine months recovery period which means that she might miss the entire 2018 season. After returning to Romania, Larisa said in an interview that the doctors thought it was the normal wear and tear athletes go through and that it could’ve happened to anyone at any time. In Montreal training, Iordache showed great improvement and difficulty that made her the top favorite to win the all around gold. Three time Olympian Sherine Al Zeiny injured her knee while dismounting the bars in qualification. The injury hindered her ability to perform her best on balance beam as she suffered from two falls. Despite that she finished in thirty sixth place which is the best finish for an Egyptian gymnast at a World championships. 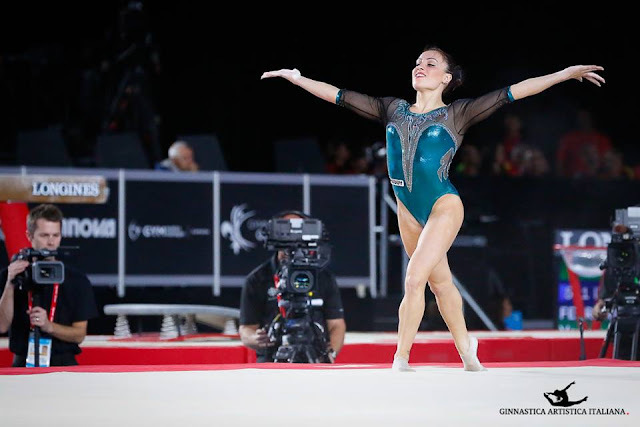 Andrade was one of the gymnasts who were expected to shine in Montreal. She had an amazing Amanar, submitted a difficult tumbling pass to be named after her and was expected to make the all around podium. Sadly, she suffered from an ACL tear on vault during Montreal training and withdrew from the competition. This was the second ACL tear on the same knee for Andrade. Her first took place two years ago which caused her to miss the 2015 World championships. Kinsella, who originally qualified to Montreal's all around final, sustained a minor ankle injury during the qualification. As a precautionary measure, coaches decided to have her withdrawn from the all around final. South Korea's Lee Eun Ju replaced her. This was Kinsella's first World championships. After Iordache's withdrawal, Smith was destined to win the all around gold. Moments before the all around final, the American gymnast injured her ankle on vault during warm up which forced her to withdraw from the competition. In the all around, she was replaced by Ioana Crisan, who was the only Romanian representative in the women's finals in Montreal. While she was replaced by Ellie Black of Canada on floor exercise. Sanli was one of the two female Turkish gymnast who were assigned to compete at Worlds. According to Gymternet, the Turkish gymnast injured her lower leg during training/podium training and was withdrawn from the competition. The Russian born Azerbaijin gymnast injured herself on her opening pass on floor exercise during podium training. According to Twitter users who attended the session, she tore her ACL. The Norwegian gymnast suffered a concussion according to Gymternet's Lauren Hopkins. Ferrari was the last female gymnast to compete in Montreal. 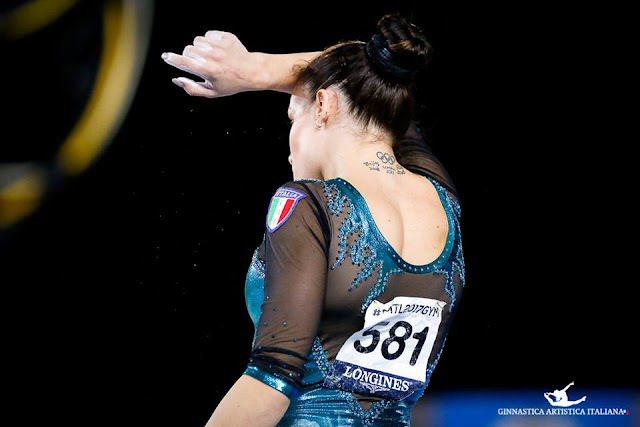 The Italian gymnast failed to land feet first on floor exercise during the event final rupturing her left Achilles. However, the Italian gymnast plans to return to the sport when she recovers. Not only is Raisman a champion in gymnastics but also a champion in sportsmanship. 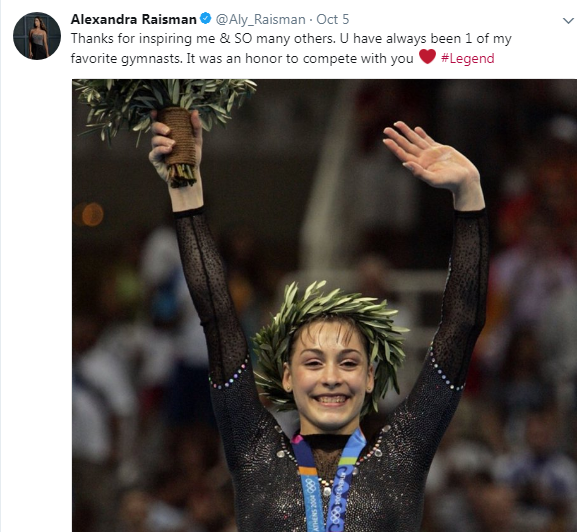 Despite not competing at the 2017 World championships, the American gymnast followed closely the competition and made sure to send lots of love and support to not only her teammates but also to the foreign gymnasts, on Twitter. Aly wished good luck to her compatriots who were competing on the first day of qualification. Raisman sent a support tweet to Romania's Larisa Iordache who badly injured herself during warm up at the qualification and had to withdraw from the competition as a result. Iordache was the heavy favorite to win the all around and beam titles. She also retweeted Iordache's tweet thanking her fans for their support. She praised Ponor who announced her retirement after the qualifications. Following Catalina Ponor's retirement announcement, Raisman praised the Romanian gymnast whom she competed with at 2011 World championships and, 2012 and 2016 Olympic Games. Raisman tweeted that she was devastated and sad for her compatriot Ragan Smith's injury just before the all around final which led to her withdrawal from the championships. Raisman celebrated compatriot Morgan Hurd's gold medal win which came in the all around. Raisman congratulated Ellie Black, who became the first Canadian gymnast to win a World all around medal - which was silver. Raisman congratulated compatriot Jade Carey on winning the silver medal on vault and sent much love to also compatriot Ashton Locklear who fell on the uneven bars in the event finals. She tweeted on having two gymnasts from Germany make the beam podium. Raisman expressed astonishment at having two gymnasts from Germany make the podium in the balance beam final with Pauline Schaefer winning gold and Tabea Alt taking bronze. Showed sympathy towards Ferrari and those who injured themselves at the competition. Raisman sympathized with Italy's Vanessa Ferrari, who injured herself during the very last routine in the women's gymnastics competition, as well with those who suffered from injuries at the entire championships. CBC Olympics posted a delightful video of a Japanese journalist hilariously reacting to Kenzo Shirai's floor exercise routine during the event finals. 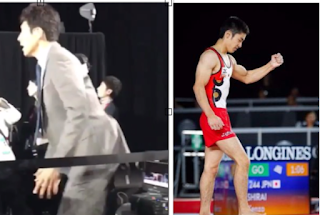 The video, which they uploaded on Instagram, was captioned "How 🇯🇵Japanese media support the athletes they cover here at the Gymnastics World Championships". The journalist can be seen breathing heavily, jumping and sweating. 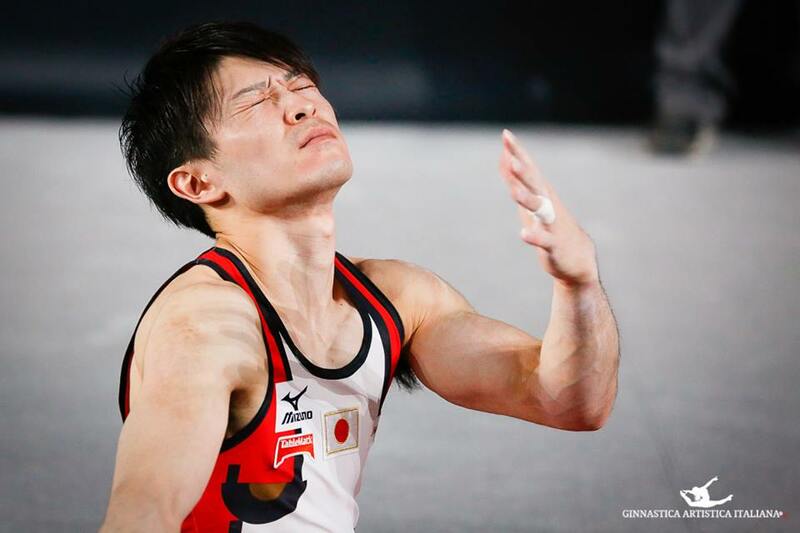 Shirai won the floor exercise gold, the third time in his career to win so at a World championships. He had also won the bronze medal in the all around. The following day, he was crowned the World champion on vault for the first time in his career. Fourth is the worst position for an athlete, they say. Japan's Mai Murakami had to face it twice in Montreal before finally getting her redemption on floor exercise. With the most difficult routine, Murakami easily claimed first place with score 14.233 making her the first Japanese gymnast to win a World gold medal in 63 years. Keiko Tanaka won the title on balance beam in 1954. US Jade Carey took silver after a terrific performance that included the super difficult double double and full twisting double layout. She had the highest execution score among the finalists, 8.5. Claudia Fragapane won Great Britain's first individual World medal in seven years, by winning the bronze medal. Fresh senior and the only representative of Brasil in these championships Thais Santos finished in fourth position. Canada's Brooklyn Moors had an artistically beautiful performance combined with rarely done forward tumbling. She had the second highest execution score but much lower difficulty than her competitors placed her in fifth place. Teammate Elisabeth Black landed completely out of bounds resulting in a 0.3 penalty. She finished in seventh place. Italy's Vanessa Ferrari, who was the last to compete, badly injured herself after failing to land on feet first on her second tumbling pass. She could not finish her routine and was carried out by medics. Teammate Italy Lara Mori finished in sixth place. 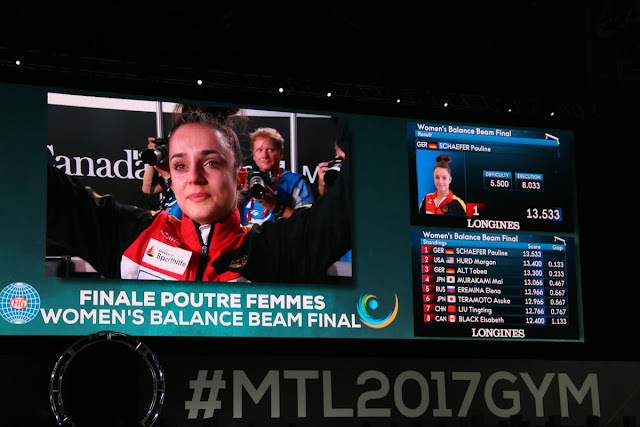 At Montreal's beam final, Pauline Schaefer has made history by becoming the first German gymnast to win a World title after the reunification in 1990. Schaefer was the first gymnast to go on the apparatus. She performed a very consistent routine scoring 13.533. This is the second time for Schaefer to win a World medal. In 2015, she won a bronze on the same apparatus. Her teammate Tabea Alt, who qualified in first place, received the bronze medal with score 13.300. Japan's Mai Murakami finished in disappointing fourth for the second time in a row. The first time being in the all around where she suffered a fall which prevented her not only from winning the gold medal but also any medal at all. US Morgan Hurd, the newly crowned all around champion, took silver. Hurd received 0.1 penalty for exceeding the time limit. The maximum allowed time for a balance beam routine is 1:30 minutes. Liu Tingting of China is another gymnast who went overtime. She received a score of 12.766 placing her in seventh place. Russia's Elena Eremina, who won bronze in the all around and silver on the uneven bars, came in fifth place, while all around silver medalist Ellie Black of Canada had the only fall in the competition and finished last. She fell on her forward salto which is the same exact element she had trouble on in the all around competition.